Since opening in 2013, Freedom Café, a volunteer-operated coffee shop in Amherst, has raised approximately $45,000 and counting, with every dollar going toward fighting against human trafficking in India. Dan Johnson, the café’s manager and co-founder, explained that the funds raised will go toward building vocational centers for underprivileged Indian women who are at the greatest risk to suffer from trafficking. In some parts of India, it is common practice for women without a financial income to sell their daughters into prostitution. At the centers, job training will be offered to provide an alternative for Indian women so they may gradually counteract the “cycle of exploitation,” they were born into, according to Johnson. Johnson and his co-founder, Shane Adams, originally learned about human trafficking as chaplains of the Christian RSO Chi Alpha. Instilled with a need to raise awareness, they came up with the idea to run a café after holding a coffee and pastry open mic fundraiser. “I also think it’s a cultural trend right now for students to want to learn how to be a barista. A lot of people volunteer with us just to learn how to make coffee and serve coffee, and it’s kind of trendy,” Johnson said. An average 50 people per year volunteer to work at the Freedom Café, some staying for multiple seasons. Amherst native Brendan Drinkwater signed up during the first year of the shop’s operation, before the café had moved to a larger building on North Pleasant Street – a decision then-student Fallon Lundgren agreed was needed. In addition to standard volunteer work, there are also internship opportunities available for students. Some of the available roles include development team manager, social media coordinator and education team member. Open Monday through Friday, the non-profit consistently holds educational events where University of Massachusetts students can learn about the realities of trafficking. Since opening in 2013, the café has hosted about 300 events, including free open mic nights every Thursday. 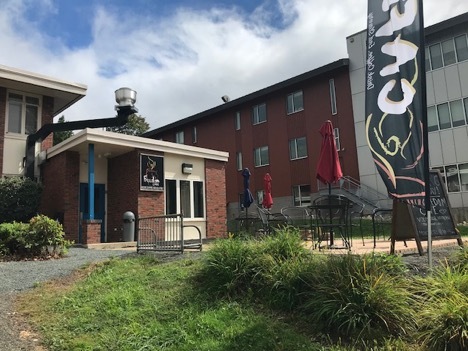 Editor’s note: Corrections were made to this article regarding when the Freedom Café first opened and that the co-founders are chaplains of a Christian RSO Chi Alpha, not a Christian NSO. John Buday can be reached at[email protected] .